This was posted last month, but, I have changed the date so that it appears in line with the rest of the questions that I posted earlier today. The following is the first question of a four-question contest that I have written for Diver Magazine's relaunched website. Check it out at www.divermag.com/online/. There are prizes if you know your movie trivia. There is a cliché in the newspaper business that says when a dog bites man it isn’t news, but, when man bites dog, Stop the Presses and rewrite the front page! The same holds true in Blood ‘N” Bubble movies. When a shark bites a character in a Blood ‘N’ Bubble it isn’t noteworthy, but, when a man kills a shark on film, well, cinematic news is made. 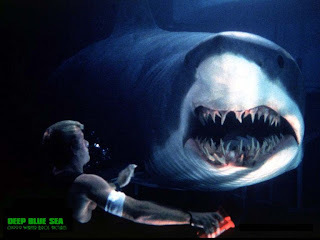 There are a few blockbuster Blood ‘N’ Bubble movies - Jaws, First Strike, The Spy Who Loved Me and Deep Blue Sea - where the shark protagonist is actually dispatched by the hero. Can you remember exactly how the shark gets it in these four famous films? Check the Diver Mag website to answer the remaining three contests. 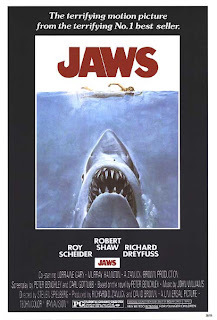 The movie Jaws was released in 1975 and starred Roy Scheider, Robert Shaw and Richard Dreyfuss. Scheider plays Martin Brody, a water-fearing, ex New York City cop who is now the chief of police on Amity Island. 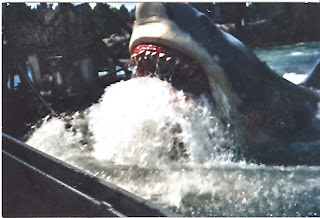 When a Great White starts feeding on tourists and townspeople alike, Scheider, Shaw and Dreyfuss set out to kill Jaws. Do you know how the shark was killed? 2. Brody lures Jaws into biting on high voltage power line dangling just above the surface of the Atlantic Ocean. 4. Martin Brody shots a scuba tank lodged in Jaw’s jaws. It explodes blowing Jaws head apart. 5. The shark gets away – sequel warning! 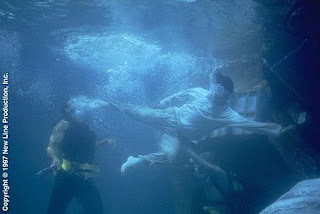 In action movies diving and sharks are often used to create drama, suspense and, if the shark bites, horror. 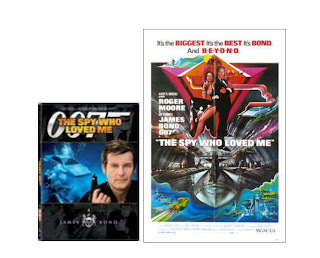 It is not surprising that many of the James Bond films include pivotal scenes that include scuba diving and man-eating sharks. In the 1977 movie, The Spy Who Loved Me (the 10th in the 007 series) crime mastermind Karl Stromberg keeps a woman-eating Tiger Shark in Atlantis, his underwater base. When Stromberg isn’t stealing submarines and their nuclear warheads, he is feeding both friends and foes to the hungry shark. In one important scene the Tiger takes on a human and loses. How? 2. Curd Jürgens’ (Karl Stromberg) giant henchman Jaws (Richard Kiel) bites the Tiger on its neck with his stainless steel teeth. 3. David Hedison (US CIA agent Felix Leiter) is fed to the shark feet first. When the Tiger bites into his leg it fires off Leiter’s ankle gun into the roof of his mouth. 4. Roger Moore (James Bond) throws an electric fan into the shark pool electrocuting the shark. 5. Barbara Bach (Russian spy Anya Amasova) wrestles the controls for a high powered laser gun away from Stromberg and turns it on the shark just before it dines on Bond sushi. By 1996 Jackie Chan movies had become big bloated blockbusters that required filming all over the world. In First Strike, Jackie Chan plays Jackie, a Hong Kong policeman who travels the world trying to locate a missing nuclear bomb. His travels take him from fighting/skiing down Russian mountains to fighting/swimming in an Australian shark tank (in reality the Underwater World, Mooloolaba, Queensland, Australia). While inside the aquarium tank Jackie must, while holding his breath, fight off spear toting bad guy divers and hungry sharks. How are the sharks dispatched? 5. The sharks aren’t killed – Sequel warning. On a remote top-secret floating research station, a team of scientists, divers and millionaires (Samuel Jackson, Saffron Burrows, Thomas Jane and LL Cool J) are searching for a cure for Alzheimer's disease using sharks and upsized DNA. 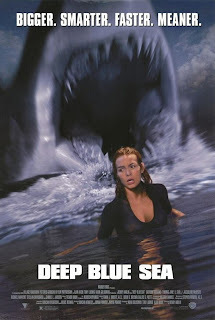 New Line Cinema marketed the sharks in Deep Blue Sea (1999) as being “Bigger. Smarter. Faster. Meaner”. Maybe so, but three genetically modified Mako Sharks are effectively dispatched by scientists stuck in a sinking underwater laboratory as bad weather approaches. Do you know how the third Mako – the biggest and meanest of them all – becomes cinematic sushi? 3. LL Cool J (Sherman 'Preacher' Dudley) while being swallowed by the Mako, stabs it in the eyes with a crucifix. 5. The giant Mako gets away – sequel warning! www.DiverMagazine.ca is randomly giving away 5 free subscriptions to readers who can correctly answer the following Blood ‘N’ Bubble shark quiz. This movie didn’t make it onto many movie screens before it faded in obscurity. Blood ‘N’ Bubble aficionados will have to do a bit of B Movie Diving in the local sales bin to now see this black comedy. Some of this 1992 movie was shot underwater in the US Virgin Islands. One of the most memorable scenes has three spies in scuba gear chasing a zombie who is walking on the bottom of the ocean wearing a trench coat and a Sony Walkman. The zombie actually gets out of the water and into the air by parasailing … with a 6 ft shark biting his feet. The shark falls back into the ocean, probably not to his death but rather into the Green Room to wait for the sequel that never came. Name the movie starring Andrew McCarthy, Terry Kiser and an unnamed high flying shark. Labels: Win a Prize. Blood and Bubbles Contest. WHAT NEW DIVE MOVIES AND TV SHOWS ARE COMING DOWN THE PIPE? Being the unofficial historian of Blood "N" Bubble movies requires constantly diving into tidal wave of press releases that roll into my "in" basket every day. Latest dive TV show that will bubble up on our screens this month? A SpongeBob SquarePants underwater visit to Atantis! According to a spokesman at Nickelodeon Home Entertainment and Paramount Home Entertainment, SpongeBob SquarePants leads an expedition 20,000 leagues beneath the sea to discover the lost city of Atlantis! In a true Haroldo Rivera history isn't being made moment (remember his opening of Al Capone's safe ) to "celebrate the monumental underwater discovery, Nickelodeon will blow it out of the water all day long with a SpongeBob convergent online and on-air event on Monday, November 12" said the network spokesperson. "The event will culminate with the premiere of SpongeBob's "Atlantis SquarePantis" TV movie guest starring David Bowie and the "Behind the Pantis - How We Made Atlantis SquarePantis" special. I can't get Nickelodeon in Toronto, Canada, so I am going to miss seeingPatchy the Pirate (Tom Kenny) hosting his own talk-show from the bottom of the aquarium at the Atlantis Hotel in the Bahamas. 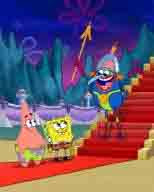 SpongeBob doesn't use scuba gearso I gues it doesn't qualify as a true Blood And Bubbles film. If anyone watches the show could they write me and let me know if SpongeBob decompresses on his way back to the surface, or does David Bowie simply squeeze the Nitrogen out of him once he is on the back of the boat. When one first starts researching Blood 'N' Bubble movies, there seems to be an endless supply of great movies to review. Blue Water White Death. Jaws. The Abyss. The list goes on from there. But, after a couple of decades, the list of "much watch" dive movies has gotten rather short. These days I do a lot of my research by diving into the B-Movie bin at our local DVD retail outlet. These are the movies that don't get much critical accalim and often go straight to video. Dive scenes are usually short, or just implied, and the low-budget movie itself is hard to stomach. Here is a brief review on what I watched over the weekend - The Marine - from a script originally written by Wrestling Star Steve Austin. This movie did make it into the theatres and grossed about $30 million before being released on DVD in 2007. Dir: John Bonito Starring: John Cena, Robert Patrick, Kelly Carlson & Anthony Ray Parker. You can lead a director to the water ... but you can’t make him dive. "The Marine", a movie made by the WWE wrestling entertainment company, stars wrestler John Cena while on sabbatical from the square ring (fans were told his absence from the ring was because he had to recover from a stab wound inflicted by “Jesus”, a bad guy in the ‘rassling’ world). ! Back on screen, after he's unwillingly discharged from Iraq, Cena comes back to America and his beautiful wife Kate ( Kelly Carlson). It only takes a few days before he is once again seeing action. When his wife is kidnapped by a gang of blood thirsty crazed jewel thieves Cena relentlessly tracks them through the swamps of South Carolina (actually Australia and Calgary!) in a stolen police car, a boat and on foot. At one point, after his “hot” police car crashes off a cliff into a dirty river, police divers are brought in to look for bodies. We see the divers suited up and get ready to jump in, but the cameras cut away before they actually get wet. Good thing too, the river looks to be only waist deep! Cena manages to kill everybody in the gang and a bad cop too, he also destroys buildings, trucks and cars. The final scene is an homage to the Bond Movie, Casino Royale. In that 007 flick Eva Green locks herself in an elevator in a sinking Venice apartment building. The lift is slowly filling with water while Daniel Craig, is busy dispatching villains. When he finally is able to jump in and pull her out, it is too late. In The Marine, Cena fights Robert Patrick at an oceanside truck stop. Kelly Carson is handcuffed to the inside of a runaway driver-less truck. The big rig ends up in the ocean and slowly begins to sink, and Kelly can’t get out. 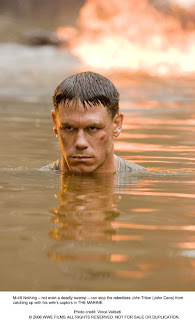 Cena beats and burns Robert Patrick into submission and then dives into the water to pull her out. He is too late, she has stopped breathing. But, after bringing to the surface he puts her in a reverse suplex hold (well actually he just gives her mouth-to-mouth) and she is magically brought back to life, just like in real life wrestling. The Marine is now available in DVD, there is a special Unrated version that includes a number of short features about John Cena. Labels: You can lead a movie director to water but you can't make him get wet. The Marine almost goes diving.